To place order, email: bfs217@gmail.com. After sharing the music of Charles Ives with students in my after school theory class at Central Lafourche High School, they had an idea for me to compose a piece for their band divided into woodwinds and brass and requiring two conductors. I took on the project, after some initial hesitation, and started devising a system of notation that would create an “Ivesian” world that would be humorous and easy to understand by both the students performing and the audience. I have always wanted to name a piece of music “Catawampus” and figured it would be a perfect fit for this work. The word itself is defined (as an adjective) as askew or awry. “Cata” means diagonally and “wampus” may come from the Scottish word “wampish” meaning to wave about or flop to and fro. However one may interpret the word “catawampus”, the definition, for me, is simply something that is not right – something that is out of line, out of whack, all over the place. And this fits the music in the piece exactly. The work is highly influenced by the music of Charles Ives and makes use of several quotations throughout. The collection of quotes are just a few recognizable tunes that I thought would work well to juxtapose over one another in different keys and styles. 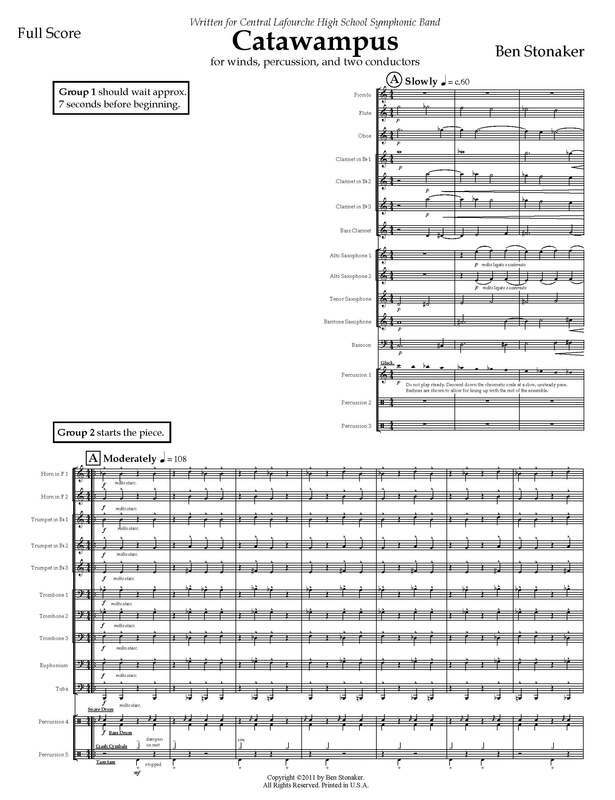 Throughout the work you can hear short clips from Beethoven’s Fifth Symphony, Tchaikovsky’s “1812 Overture”, Ives’ “Country Band March”, Lady Gaga’s “Bad Romance”, themes from Super Mario Bros., the Dies Irae, “Korobeiniki” (Russian folk song from Tetris), and a few nursery rhymes (“Mary Had a Little Lamb”, “Pop Goes the Weasel”, “The Itsy Bitsy Spider”, and “Twinkle, Twinkle Little Star”). Balancing the ensemble so all these quotes can be heard will prove quite challenging. The dynamics in the piece clearly show what should be heard clearly and what should be blurred or in the background.